Cylindropuntia imbricata, tree cholla, is found in a wide range of environments, from the hot deserts of west Texas to the Colorado mountains above 6,000 feet. 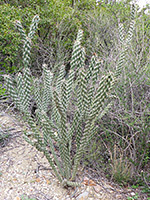 It has stout, quite thick branches, bearing fairly short white or light brown spines, 10 to 30 per areole (occasionally fewer), that allow the green stem color (purplish in times of cold weather) to be clearly visible, and the plant reaches heights of 8 feet, with most stems quite high above the ground, supported by a strong central trunk. The attractive violet flowers are followed by knobbly orange fruits that stay attached to the plant for many months. 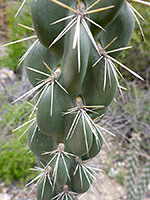 Spines grow from elongated tubercles, which help differentiate the plant from similar species in its range, principally the cane cholla.